Can Studying the Ice Sheets Save the Earth? The ice sheets are big and remote, and it takes a huge amount of logistics to do even the most basic work there. Your donations will cover travel costs to weather stations and maintenance of these stations. Your funds would also pay for more researchers who can help Dr. Howat process the huge amount of data involved in the studies. With the increased pace of research, they hope to have a complete model of the Greenland Ice Sheet within a year. As the Greenland and Antarctic ice sheets melt into the ocean, sea levels rise. The rate of melt has dramatically increased over the past twenty years, and continues to accelerate, potentially affecting the hundreds of millions of people living near sea level, and trillions of dollars' worth of infrastructure. Even though a small increase in sea level rise could have disastrous consequences, scientists don't yet understand enough about how ice sheets work to accurately predict how fast sea level rise will happen. Dr. Ian Howat of Ohio State University, in collaboration with other universities and government labs, is taking advantage of new satellites and advanced supercomputing to tackle this problem head on. He knows that rapid glacier melt and sea level rise occurred in the ancient past but believes that the current changes are unprecedented and due to human induced warming. 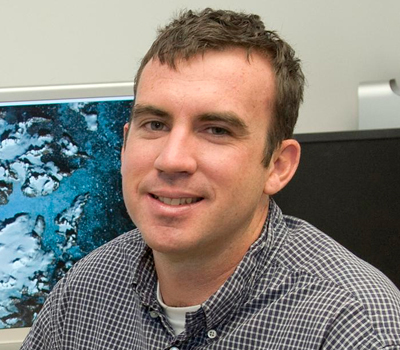 Dr. Howat's team is among the only groups that fuse observations and large-scale computer models, so that their observations go directly into improving predictions of ice sheet change. They have developed the most advanced tools for applying observations from the latest generation of satellite imagers. By building the input datasets required to constrain very powerful computer models of the Earth system, Dr. Howat's team will provide estimates of ice sheet changes at a break-through level of confidence. Using software that his team developed, Dr. Howat is constructing very high resolution digital elevation models of areas of the Earth important for sea level rise, including the ice sheets and coastal zones. These models will allow the team to detect glacier changes with unprecedented detail. Humans face the threat of accelerated sea level rise, altered ocean circulation and loss of freshwater supply. With Dr. Howat's accurate forecasts regarding glacier melt, policy makers can make more informed decisions in the future regarding climate change, infrastructure, energy and resources. Dr. Ian Howat is a glaciologist focused on the dynamics of glaciers and ice sheets, and particularly their rapid response to climate forcing. He uses a wide range of observations from remote sensing, in situ data networks and field campaigns to constrain quantitative models of ice flow. These models are used to predict future changes in ice sheet mass balance and rates of sea level rise. Howat has been a participant and leader on numerous science expeditions to Antarctica, Iceland, and Greenland. Dr. Howat got hooked on glaciers as an undergraduate while searching the ocean floor for signs of the ice sheet's retreat after the last ice age. As the team collected data and made hypotheses, sometimes they found something totally unexpected, leading them into an entirely new direction. He found this to be incredibly exciting, and decided to delve deeper into collecting glacier change related data.